I love this movie! Parents with small kids should go see it! Adults without kids should go see it! It has wit, charm, intelligence, pirates, the Elephant Man, a dodo, swashbuckling, ham-eating, Brian Blessed, and all in an action-packed, emotionally satisfying 85 minutes. Honestly, this is about as good as cinematic entertainment gets! Kudos to Aardman Studios (home of Wallace and Gromit) for brilliantly mixing hand-made stop-motion animation and CGI backdrops, and achieving a level of visual wit that demands repeated viewings. Kudos to director Peter Lord of Morph fame, for delicately balancing comedy and action. Kudos to all the voice artists, but particularly Hugh Grant as Pirate Captain - a rare chance to see his comedy chops. But most of all, kudos to Gideon Defoe, who wrote the screenplay based on his own novels. 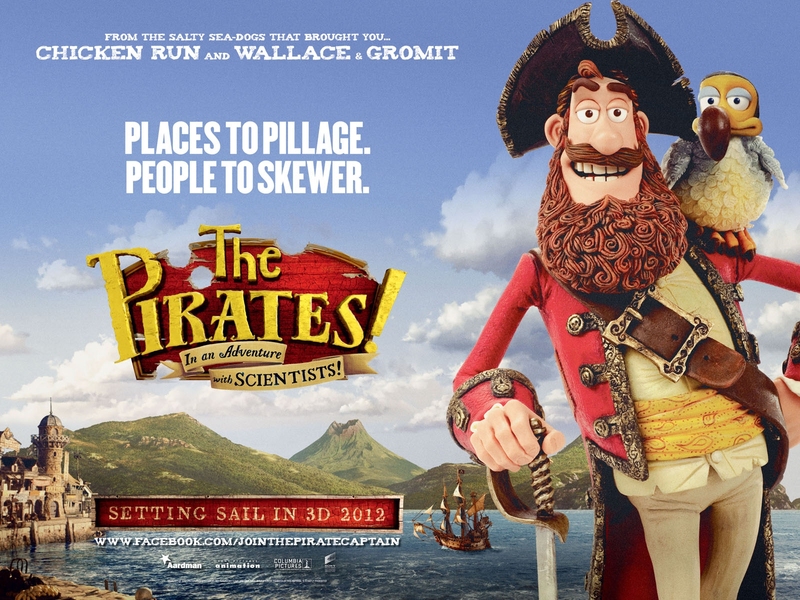 I really hope Aardman follow the ADVENTURE WITH SCIENTISTS! * with the rest of the series. In this instalment, we meet Pirate Captain and his dead-pan named crew (Number Two, Albino Pirate, Surprisingly Curvaceous Pirate...). He's a loveable old cove, but pretty hapless and destined to lose the Pirate of the Year award unless he can pull off a massive coup. His chance arrives when he mistakenly holds up Charles Darwin's Beagle, and Darwin (David Tennant) tells him that his beloved parrot, Polly, is in fact a Dodo! There follows a trip to London to display Polly at the Royal Academy, thereby winning some booty, and an adventure against a sword-wielding Queen Victoria (Imelda Staunton) who hates, hates, HATES pirates! There's so much to love here. The richly decorated backdrops are full of visual jokes. But in the foreground, I loved the whole Brian Blessed worship. I loved the idea of Darwin's butler being a trained monkey with comedy flash-cards. I loved the idea of Queen Victoria as a murdering ninja. Most of all, I just loved Hugh Grant in his best performance since ABOUT A BOY. This is hands down my movie of the year to date. THE PIRATES! is on release in the UK, Ireland, Belgium, France, Denmark, Germany, Finland, Lithuania, Norway, Sweden, Italy, Australia, Kuwait, New Zealand, Serbia and Estonia. It opens on April 12th in Greece; on April 20th in Argentina, Colombia and Romania; on April 27th in the Netherlands, Portugal, Russia, Canada, India and the USA; on May 11th in Brazil; on May 17th in Hungary; on June 7th in Serbia; on July 20th in Spain; on July 26th in Hong Kong; on August 9th in Israel; and on August 30th in Singapore. *I'm not sure why the film has been retitled for the US market unless the marketing department think the US has become a crypto-theocracy in which even the mention of science is going to alienate audiences?